6th Coal Summit & Expo 2016 is being organized on 6th and 7th of September in New Delhi. Sri N.sridhar, IAS, C&MD SCCL has been invited to act as Co-Chairperson for the session “Policy Perspective”. In his concluding remarks, N.Sridhar said that in present Indian coal scenario we have to adapt Eco friendly mining practices and produce quality coal at cheaper rates and in bulk quantities from Underground mines. He said that we have to look at Australian experience in coal production where there are UG mines which produce 3 to 5 Million tons per annum. This coal summit is being supported by five central ministries namely Ministry of Coal, Power, Mines, Steel, Railways and also Niti Aayog. Representatives from government and non-government coal sectors are invited to take part in it. Manufactures of mining machinery are also taking part in it. The summit was inaugurated by Sri Balvinder Kumar, Secretary, Ministry of Mines. About nine technical sessions are being conducted on topics like Policy Perspective, Coal Exploration and Production, Coal Utilization, Infrastructure, Technology, Environment, CBM & CMM, Coal Beneficiation etc. 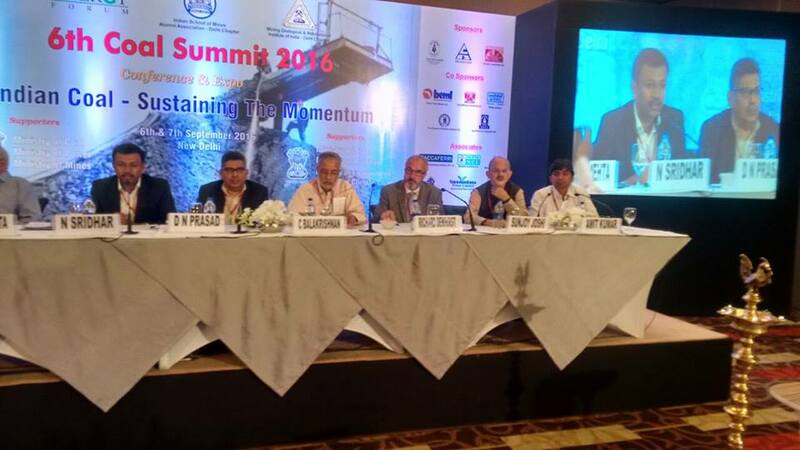 Coal India Chairman Sri Sutirtha Bhattacharya, C&MDs of Coal India Subsidiaries and Private Coal companies took part in this summit. Sri B Ramesh Kumar Director (Operations), Sri M.Mallesh CGM, Sri B.Bhaskar Rao GM (P&P), Sri Raghuram GM have also participated in the summit from Singareni.